I think most women want to hear, "I missed you. I was thinking about you today!" from their man at the end of a long day. Unfortunately for me, I'm not one of those women who are on the receiving end of such affection. Instead, Jason comes stomping through the living room carrying a huge chunk of Chocolate Pecan Coffee Cake, lovingly looking at it like it's the best thing in the world, while saying, "I've been thinking about THIS all day long." W.T.F? I come in second to sweets! He's lucky that I kind of like him or there would probably be hell to pay for having such a thick skull. And, I let it slide because I agree with him. The cake is think about it all day kind of good. If you want to score extra brownie points with the sweetie, serve up some chocolate pecan coffee cake on Valentine's Day. Warm out of the oven with a cold glass of milk = pure bliss. Where's the coffee in it? Jason drunk it? :) He did, at least, brought you a piece, yes? Hope you two get naughty for Valentines! I get the sweets thing on Jason's behalf as I do love my sweets! But now what does Jason do for you???? Don't let me down Jason! I stuck up for you. I think Theresa wanted some diamonds...but probably power tools....wait that's me. Hope you two have a special day! Cheers. He did buy me Lindt truffles, so I can't be too mad ;) No diamonds please. I am not a jewelry girl. Crafting supplies would be most welcome, though! lol well if you make it he is technically making you #1 as his #1 is something you made. Hmmm, yeah that may not fly, huh? I love coffee cake! It's so perfect for brunch or brunch parties. That looks so yummy! There's nothing better than a good coffee cake, in my opinion. I can't wait to give this a try. I cannot wait to make that. I love that it uses honey. I LOVE honey in baking. This looks so delicious, yummy! 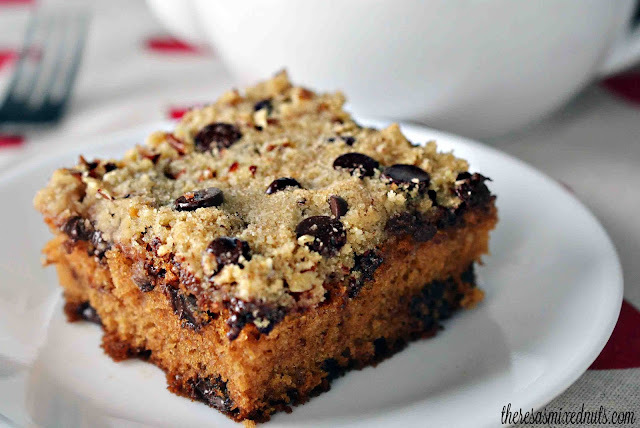 I love coffee cake and bet this would hit the spot when I have a craving for such! This looks so good! And I love that honey is a component! WOW this coffee cake looks delicious! The chocolate, pecans and brown sugar must make an amazing combination. I dont think I have ever had chocolate coffee cake but by the looks of it I am missing out! I will have to get this made A.S.A.P! You can't go wrong with chocolate! We're not huge gift givers here for Valentines Day. I do mack a special breakfast, and have chocolates setting at everyones spot at the table. These look like a fairly healthy snack/dessert. Thank you for sharing, as my family has been trying to modify their diet this year. I'm here sitting with a very lonely cup of coffee. This cake looks delish! I love coffee cake. I haven't tried chocolate coffee cake before. Some things just taste so yummy it's hard to think of anything else. What a scrumptious looking chocolate pecan coffee cake. I hope you have a cheerful Valentine's Day card waiting for you tomorrow and enjoy the day. This sounds really good! I love coffee cake too. I love to bake with honey. I actually prefer it over sugar. This dessert is so yummy looking and the ingredients are too die for. Love love LOVE coffee cakes! This sounds scrumptious and I know someone who LOVES anything pecan who would be over the moon with this :) Yum! It has been years since I've made a coffee cake. Yours looks a lot moister than the ones I used to make. I think that is why they call them coffee cakes, you needed a lot of coffee to wash them down. This cake looks delicious! I would so love to try it! yuuum yuuuum....look so delicious, Theresa..